If you’ve ever visited the beautiful island paradise of Maui, you know that it has a rhythm all its own. The attitude is easygoing and the lifestyle is laid-back. People from nearly every corner of the globe are drawn to explore its many wonders. Everyone from immigrant workers to undercover celebrities, rastas, hippy dropouts, business moguls and natives from every Polynesian island live side by side, woven together by the prevailing, loving spirit of Aloha. Rich with a diverse landscape of deep forests, miles of pristine beaches and rocky deserts, Maui’s natural beauty is simply sublime. Day in and day out, crystal waters wash tirelessly upon its golden shores. Trade winds out of the East carry the scent of tropical flowers, sweet fruit and salty seawater across the land. Hardly a day passes without the misty clouds and the sunny skies conspiring in arcs of prismatic color. The second largest of the Hawaiian chain of islands, Maui emerged over 70 million years ago as volcanic magma spewed from the earth’s core. These eruptions created Maui’s massive volcano, Haleakala, which rises majestically up from the sea to over 10,000 feet in elevation. Haleakala, “The House of the Sun”, as it translates, is large enough to fit the entire island of Manhattan within its vastness. The deep brown and dark red hues of (no "the") the sand extend for miles within its crater. Rich with iron oxide, the dunes create an alien landscape. When the moon is full and the night sky is clear, the crater offers courageous hikers a magical experience. 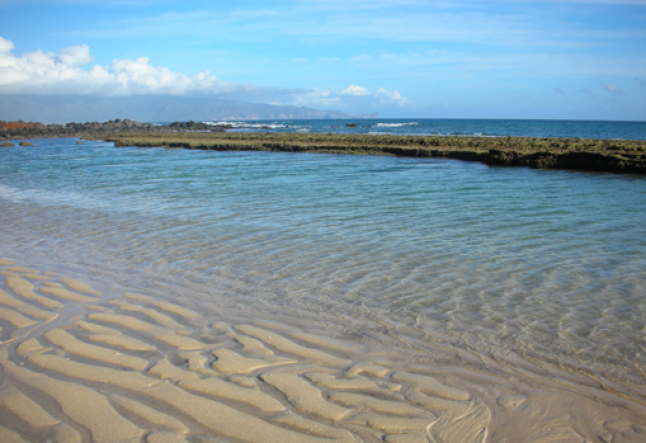 On the north shore of Maui is the eclectic town of Paia. With boutiques, cafes and surf bars, this bustling center, which has only one traffic signal, is a quaint haven for tourists as well locals. The health-conscious town caters to yogis by offering two studios. Maui Yoga Shala is a bohemian yoga/dance studio decked out with an open-air lounge, Balinese furniture and fresh coconut water post-practice. On the other 'side of town' is Paia Yoga equipped with cork floors, yoga wear and a dynamic schedule. Just up the road from Paia, set amidst lush, tropical gardens is Lumeria. This private sancturay offers yoga and meditation overlooking stunning ocean views. 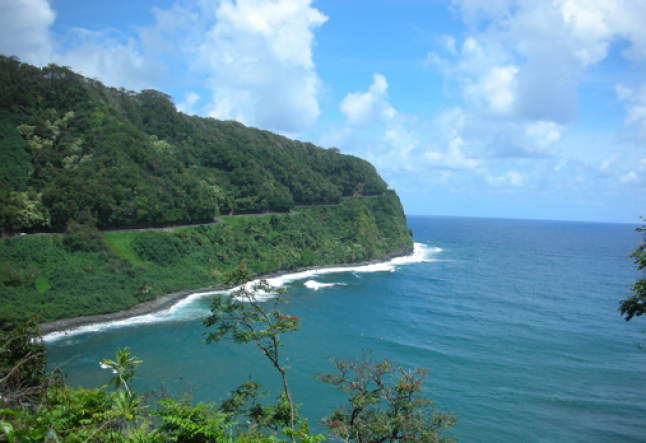 Heading east out of Paia the Hana highway meanders over bridges and above bays until reaching the town of Hana. Located on the backside of Haleakala, this coast features rolling hills, lush jungles and black, red and white sand beaches. Cascading waterfalls that have sculpted Hana’s Seven Sacred Pools are one of the reasons this area is considered by many to be heaven on Earth. 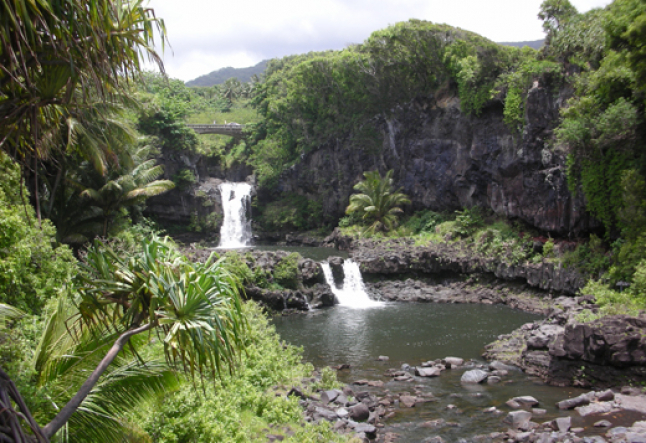 Continuing through Hana and past Kipahulu, the lush, thick landscape gives way to an expansive desert. Cacti and cattle dot the hillsides. From here, the Big Island of Hawaii becomes visible on the horizon. Sometimes, however, the skyline fills with “vog” (volcanic gasses combined with fog) generated by the island’s active Kiluea volcano, leaving visibility at a minimum. Eventually this road winds around and the land becomes lush and green again. Known as Upcountry Maui, the communities that thrive on the slopes of the volcano are laden with farms full of horses, cows, goats, sheep and even deer. Kula Lavender Farm is one of these special places, known for its lavender tea and scones. Located at an elevation of 2,000 ft., Ulupalakua has views of the surrounding islands of Lani’i, Molokai’i and Kaoholawe, and is home to the Tedeschi winery as well as some old-fashioned rodeos. Maui’s cowboys, better known as Paniolos, were brought to Maui years ago from Mexico in order to teach the locals how to properly raise cattle. Although Maui receives visitors all year round, the winter season brings “snowbirds”: visitors who return year after year from chilly mainland states seeking the warmth of the Hawaiian sunshine. The island’s north shore comes alive at this time with throngs of South American and European surfers. Big waves beckon the brave. Jaws, locally known as Peahi, draws crowds in amazement as surfers ride waves over 40 feet high. 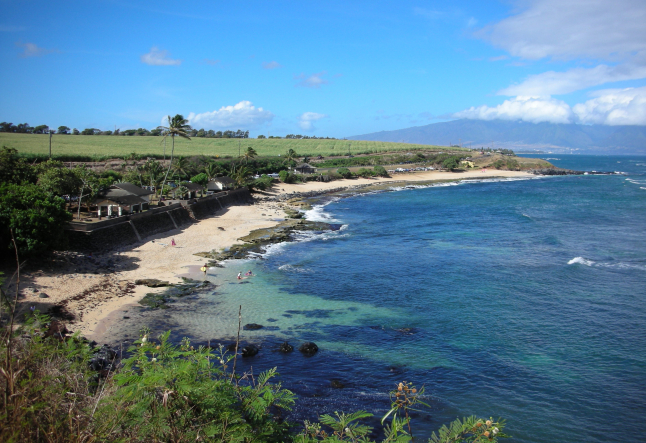 Popular surf spot Ho’okipa plays host to numerous windsurfing events and surf contests all season. Exploring the underwater world that surrounds Maui is like taking a plunge into a dreamland. Pods of dolphin splash in the azure waters. Somewhere around mid-November, during their annual journey from Alaska, whales arrive to give birth in the warm shallows surrounding Maui. Their songs carry beneath the waves like aquatic birds in conversation. Halfway between Maui and the neighboring island of Kaoholawe is the small crater of Molokin. With coral reefs that attract thousands of fish, turtles and sea creatures, this aquatic world thrives. On the southern and western shores of Maui, luxury resorts such as The Four Seasons and the Grand Wailea feature fine dining, day spas and miles of beachfront suites. These grand complexes are located in the tourist centers of Lahaina and Kihei. Busy with endless restaurants and shops, these areas were designed with tourists in mind. Nightly luaus as well as the visually stunning stage production Ulalena, tell the history of Maui through music and the hula. Dance clubs and live entertainment at hot spots like Hapa’s and Paradise Bluz, pack in crowds of partiers looking to shake things up after days spent sunning and surfing. In addition to all the action Maui has at least one movement studio in every town, offering a variety of dance and yoga classes. These range from hip-hop to belly dance and from anusara to ashtanga yoga. So many natural wonders abound on Maui that until you experience the majesty of such an exquisite place it can seem almost unreal. Time has a way of standing still there. People smile while passing on the street. Children run wild and free on the beaches. The warm waters that wash the shores of this paradise carry with them an effortless serenity. As sunset fills the sky with bright shades of crimson, violet and fuchsia, the horizon inspires peace of mind. Darkness envelopes the island as myriad stars and constellations shimmer high above. 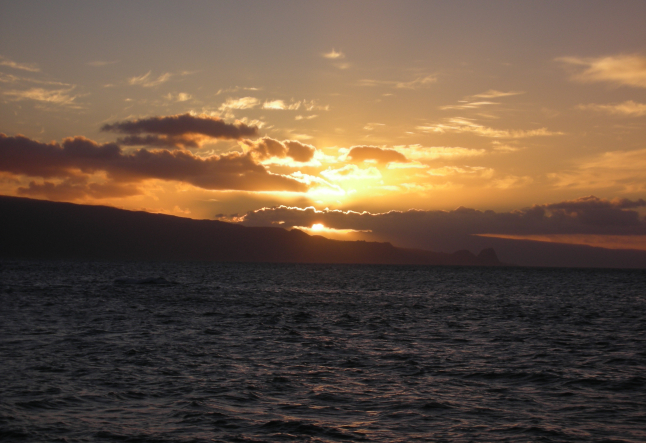 Like a deep breath at the end of a long day, Maui offers natural ecstasy for those wise enough to inhale.